TGOS (Total Green Office Solution) is a Ricoh’s solution that supports visualizing, analyzing, and minimizing the environmental impacts and costs occurring at each step of selection, use and recycle of Ricoh products and services. To fulfill this, we assist customers continuously also in optimization of their workflows and ways to work. Through TGOS, we Ricoh Group provide “Sustainable Offices”(*) that support customers’ knowledge management. To Ricoh, an “Office” means any place where people generate new values. A “Sustainable Office” is an ideal workplace that meets the management’s needs from three primary viewpoints of sustainability in balanced manner. Generation of new values through cost reduction and productivity improvement. 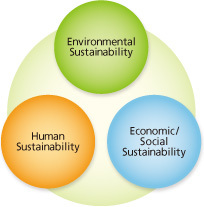 Based on the said long-term target, Ricoh tries to minimize the environmental impacts throughout product lifecycles. Specifically, we visualize the environmental impacts resulting from our own activities including “Procurement”, “Designing”, “Production”, “Selling” and “Servicing” of involving departments and set reduction targets for such impacts. At the same time, we encourage you to visualize the environmental impacts occurring through the use of Ricoh products at your sites. Believing that the visualization of the impacts of Ricoh products to the customer environment will bring mutual benefits to the global environment as well as the customers and Ricoh itself, we offer this environmental solution in combination with cost reduction proposals.